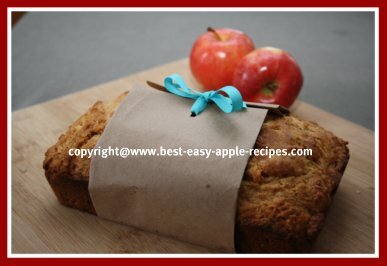 Here is a Collection of the Best Apple Bread Recipes. When local apple orchards are harvesting the lovely golden, red or green apples, consider baking apple bread! A freshly baked loaf of Apple Bread is a treat that exudes the flavors of fall in all its glory. Fruit breads can be served for a breakfast or brunch treat, for lunch, or for a healthy, tasty, mid-day snack! Bread made with apples include loaves made with fresh grated or chopped apples, or applesauce. These recipes often include chopped nuts or additional fresh fruit or dried fruit such as raspberries, cranberries, raisins, craisins and spices such as cinnamon. I really enjoy making bread with apples, and I absolutely love the aroma which fills the kitchen, and spills into the rest of the home when baking with apples. Nothing quite measures up to the taste of freshly baked fruit bread served warm with a dollop of butter! Other favorite toppings include jam, jelly, marmalade or cream cheese. If you are looking for a tasty treat for a Thanksgiving breakfast, brunch, lunch or snack, here are mouth-watering bread recipes that everyone will enjoy! Making homemade quick breads and loaves have become very popular. Not only are they easier to prepare than breads made with yeast, but they are also much quicker to prepare because there is no "rising time" to factor in when preparing the breads. Baking powder, baking soda, steam, or air - rather than yeast is what leavens quick breads. After baking a loaf of apple bread, turn it out of the pan and allow it to cool on a wire rack. The cooled bread should be stored in an air-tight container, or wrapped in foil or clear plastic wrap to keep it fresh, and prevent it from become dry.